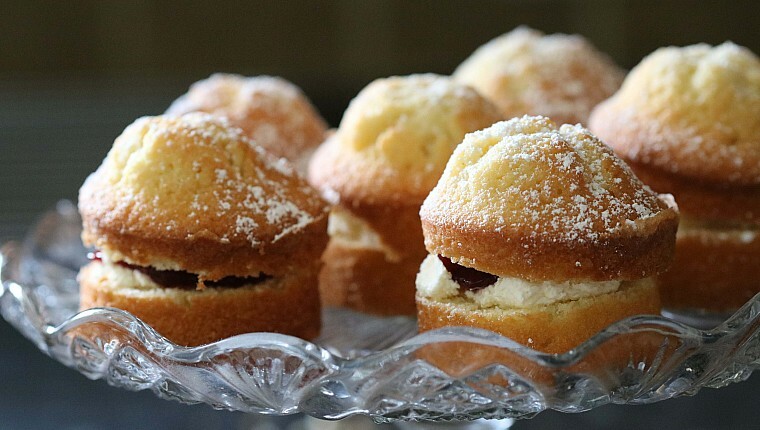 Tea and cake is an essential part of the National Garden Scheme experience, so to celebrate Festival Weekend and glorious gardens we’re sharing our very own recipe for mini Victoria sponges. The Victoria sponge is as traditionally British as visiting gardens, so there’s no better cake to bake in celebration of one of the most beautiful months of the gardening year. And it’s an ideal recipe to use a garden glut of fresh strawberries too. Festival Weekend will see gardens open in every single county across England and Wales on 2nd and 3rd June – giving everyone access to private gardens in bloom at the height of the season. Visitors can enjoy a variety of gardens over the weekend – including small urban spaces, cottage gardens and gardens opening together in a village group, as well as impressive country house gardens and community gardening projects. Find your nearest Festival Weekend garden. Heat your oven to 180°C/350°F/Gas Mark 4 and place muffin cases into a 12 cup muffin tray. Beat the softened butter and caster sugar for 3-4 minutes until pale and fluffy. Add the vanilla extract and then the eggs one at a time, beating thoroughly after each addition. If the mixture becomes curdled add 1-2tbsp of flour. Sift the self-raising flour and baking powder into the mixture and stir gently until combined, being careful not to overmix. Pour a quick splash of milk into the bowl to loosen the mixture and then distribute evenly into the muffin cases. Bake for 15 minutes or until the muffins are golden and a skewer inserted into the middle of one of the cakes comes out clean. Place the muffins onto a wire rack and once they are cool, remove from their cases and slice horizontally. Add the vanilla extract to the cream and whisk until it holds it shape. Leaving some room around the edges of the cakes, spread strawberry jam onto the bottom layer of each cake and spoon the whipped cream on top. Place the sliced strawberries on top of the cream, before putting the top half of the muffins on each cake. Sift icing sugar over the muffins and serve.